TRIVIA of Noh : Q99 : What are some benefits of Noh vocalization? | Home | Trivia | Q99 : What are some benefits of Noh vocalization? What are some benefits of Noh vocalization? 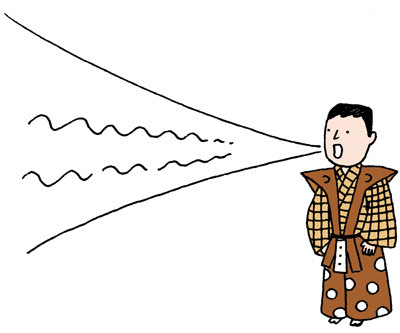 In performances of Noh and Kyōgen, very loud voices are a characteristic of the actors, chorus and musicians. It is often said that when actors try to make their voices louder, they tense the stomach to let the voice out. The "stomach" in this context means the dantian, an important spot for qugong (a form of Chinese philosophy and physical exercise) and Eastern medicine, located about three finger-widths below the navel. Why does the voice become louder if we tense the stomach? It is known that if we tense the stomach to let the voice out we can greatly strengthen our muscles. This is because when the voice is produced, the pelvic floor underneath the pelvis and the thoracic diaphragm below the lung both vibrate, activating the inner muscles between them. This also has health benefits. Some researchers in the healthcare field suggest that vocalization for Noh theatre may be valuable for people in rehabilitation. At the same time, it is also believed that producing a loud voice can take off a brake that we unconsciously place on our minds. Athletes in competition may shout because they automatically know they will be able to draw on more power than usual. By releasing us from stress, voice production from the stomach may also help to maintaining good mental health.